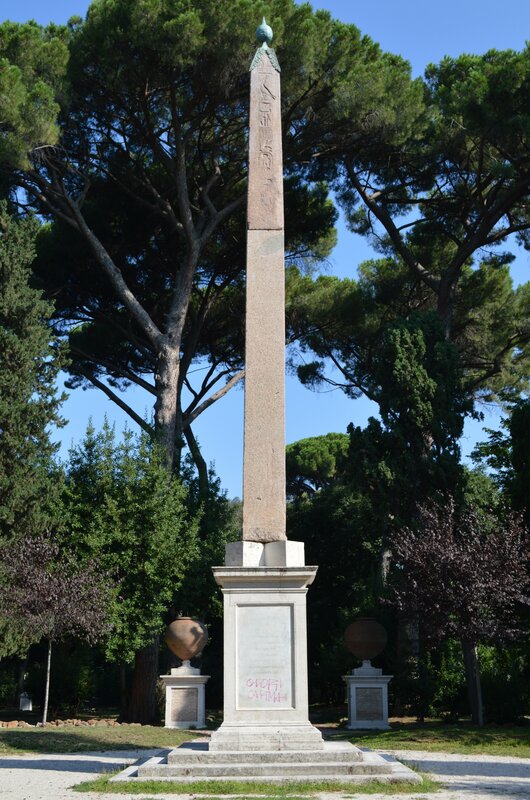 This obelisk is in the park of Villa Celimontana. Santa Maria Domnica church is in the right side of the park entrance of Villa Celimontana. Some tourists come to the church because its interior is decorated with beautiful mosaics and frescoes. A small boat of the fountain in front of the church is also famous. So the church is also called as a "Santa Maria Church of the boat." Villa Celimontana is formerly Villa Matti. But now, it becomes public park. Former palace of Matti has been awarded to the Italian Geographical Society. The access for Villa Celimontana is a little inconvenient. The closest subway station is "Colosseo" on Metro Line "B". Go East direction along the Colosseo, and proceed South-East on Via Claudia. You can see the old Roman wall on right side, then after 600 meters ahead, there is a church "Santa Maria in Dominica" which the small boat fountain is in front of the church. 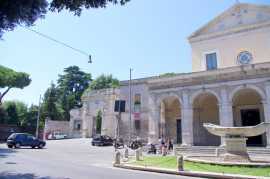 The entrance of the park (Villa Celimontana) is at the next to the church. Another approach is using the Bus from Lateran Obelisk (Obelisco Lateranense). In fact, I used this route when I re-visited here in 2014. Alternatively, after getting of the Metro San Giovanni Station on Metro Line A, go up the steps ahead on the left beyond the exit gate, the bust stop is there. Then, take Bus #81 (for Risorgimento) or #673 (for Rho). The Bus will stop just in front of the park entrance gate, the name of bust stop is "Navicella-Villa Celimontana". Thus, this is my recommendation for Villa Celimontana because you can go there without long walk. Go strait about 50 meters after the entrance gate, which is left side of the church "Santa Maria in Dominica". Then you can find the obelisk at left side. It would be helpful if you see the Google map before visiting here. 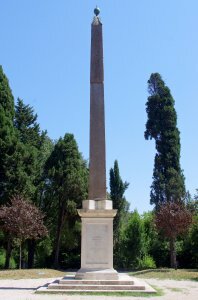 The original Egyptian obelisk is short, only 2.68 meters (*1). The lower portion was added later, and the total length is 12.23 meters (including pedestal) (*2). 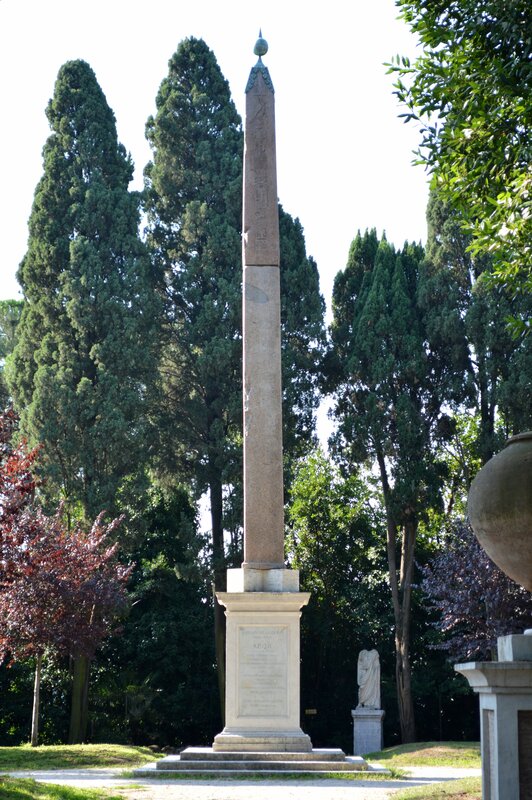 (*1) The Obelisks of Egypt, Labib Habachi; Wikipedia: "List of obelisks in Rome". (*2) Wikipedia: "List of obelisks in Rome". This obelisk is one of the pair, which was originally erected in front of the Temple of Ra in Heliopolis. The pair obelisks were carried to Iseum, the Temple of Isis in the ancient Rome and erected there. After that, the details are unknown. 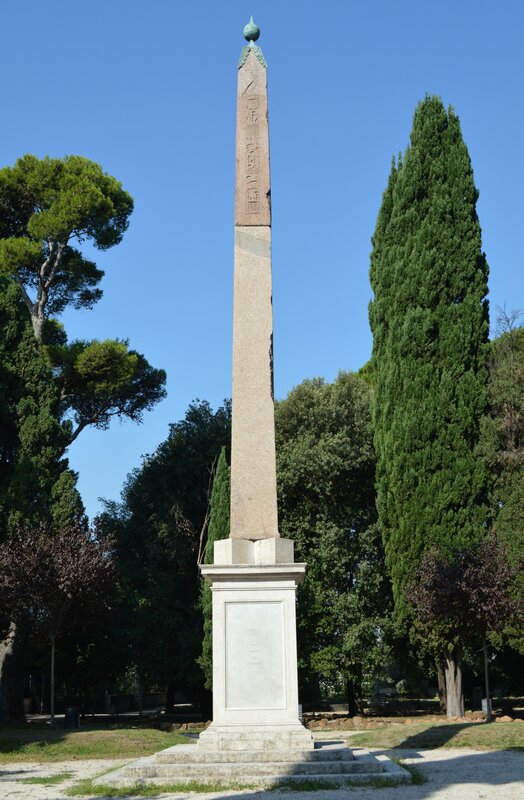 In 14th century, this obelisk stood at the east of Santa Maria in Aracoeli on the Capitoline hill (Monte Capitolino). And this has been standing there for about 100 years, but seemed to have toppled and moved out somewhere. Then, Duke called Ciriaco Mattei erected it in his villa (Villa Celimontana), who obtained this obelisk in late 16th Century (1582?, 1584?). After that, the Spanish statesman Manuel de Godoy (1767-1851) temporarily stayed in this Villa, and restored the villa. Another pair obelisk is currently in Piazza Rotonda [in front of Pantheon] which can be seen less than 6.34 meters high (obelisk portion only). So, this Celimontana Obelisk was assumed that about 7 meters long (high) initially. You can see two obelisks together at right. Inscriptions are on the four sides, particularly the East side remains clearly. Horus name, coronation name and birth name of Ramses II are clearly confirmed, but the lower portion after the birth name is lost and unknown. Also, the cartouche of Horus name and coronation name of Ramses II can be seen on the pyramidion at top. Nobody was here when I took these pictures at just after noon, although some visitors were at a church "Santa Maria in Dominica". This would be because here is not a sightseeing spot.